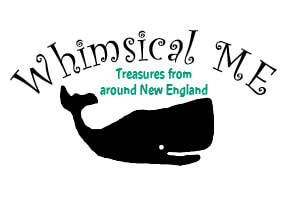 Whimsical ME features gifts from around New England, with an emphasis on Maine-made goods. We have a large selection of Sea Bags, made on the waterfront in downtown Portland, including wristlets, handbags, totes and pet supplies. We are huge fans! We stock a variety of candles from Seawicks, Chowdahedz and other local companies; soap and scrubs from five different Maine makers, and wall art from Benoit's Design Company in Westbrook. We also sell Maine-made jewelry, tee shirts and hats, pet treats, leashes and toys; wood products from New Hampshire Bowl and Board; sweet and savory jams from Stonewall Kitchen; and adorable bags from Little Man Originals in Massachusetts. Come have a look at 239 Main St. in historic downtown Saco. Visit us for all of your gift-giving needs....and treat yourself while you are here! We have lots of cute things suitable for holidays and birthdays. And stop in if you need a hostess gift...we've got perfect selections for that, too!